On Saturday, the weather was gorgeous (it may have been only the second day since before July 20th that it didn’t rain); the Old Spa was packed; and the card featured full-field, frequently good betting races with some competitive finishes. And if you weren’t happy with the product in front of you, you could turn your focus westward to the racing at Arlington; though significant attention to simulcasting doesn’t frequently seem to be a feature at Saratoga, yesterday, folks juggled their betting and racing attention, with the result that spirits and excitement were high pretty much non-stop. This was the Saturday that everybody dreaded, the Saturday without a graded stakes races, the Saturday that was the epitome of all that’s gone wrong with racing in Saratoga, the Saturday that featured—horrors!—a series of ungraded stakes, all of which honored notable historical New Yorkers, on the day that Saratoga Race Course celebrated 140 years of racing in Saratoga. Hip #212: dk b/br filly, Holy Bull-Miney’s Awesome (Awesome Again), sold for $100,000. Sire won the Futurity, the Travers, the Met Mile, the Woodward, and the Dwyer; dam sire won the Jim Dandy, the Whitney, and the Saratoga Breeders’ Cup Handicap. 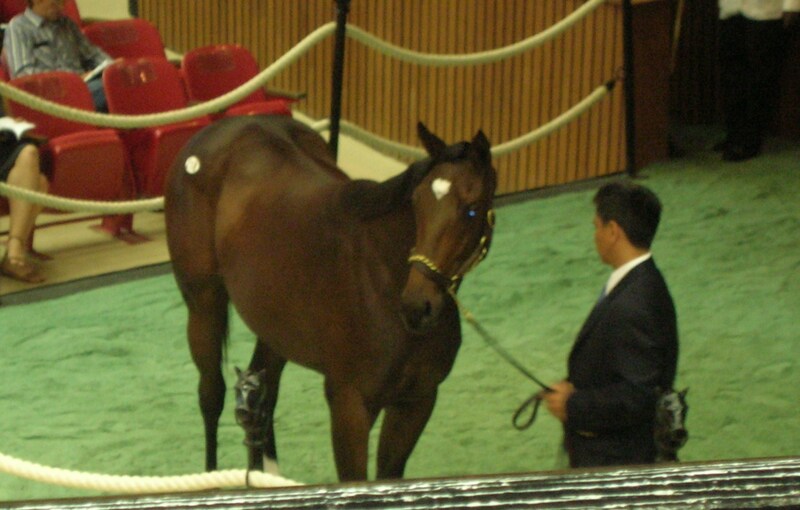 Hip #216: Power Punch, Congaree – M.J. Bean (Cormorant), sold for $60,000. Sire won the Wood Memorial, the Jim Dandy, the Cigar Mile (twice), the Carter Handicap; dam sire won the Bay Shore, the Gotham, and the Withers. Cormorant died a year ago, so this is his last crop, and Pedigree Query refers to him as “arguably the most accomplished thoroughbred stallion ever in New York,” noting that he was the oldest living sire of a Kentucky Derby winner (Go For Gin). 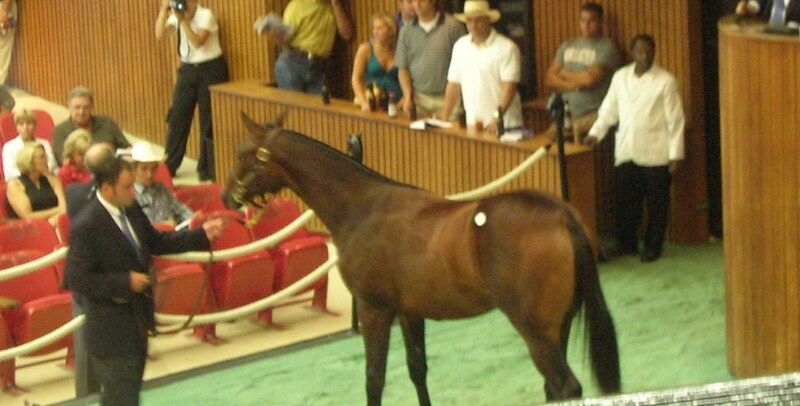 Hip #217 (pictured below): b colt, Hook and Ladder – Montjac (Montbrook), sold for $60,000. Not a particularly stellar racing history, with a second in the Forest Hills Handicap and a third in the Carter, though he’s on his way to a nice career as a sire, with Big Truck and Spanky Fischbein having a decent start to their three-year-old years. 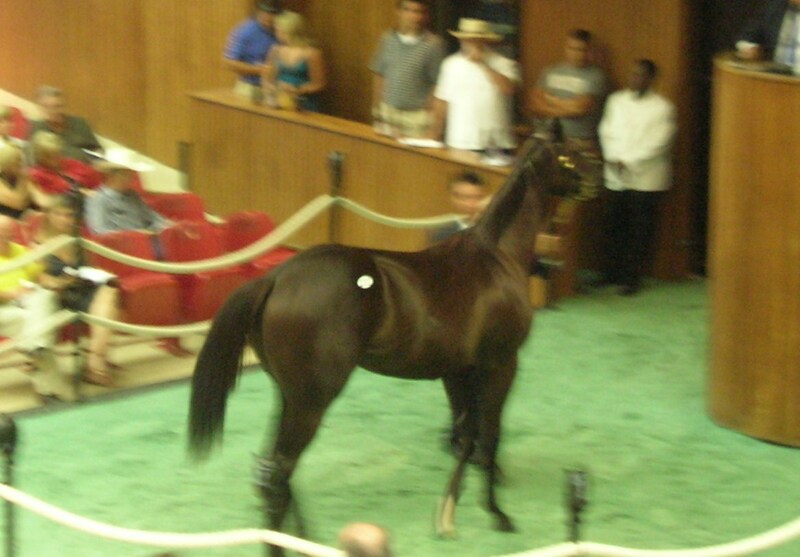 Hip #218 (pictured below): Sing A Melody, Tiznow – Morning Sun (Dehere), sold for $100,000. Sire won the Breeders’ Cup Classic (for the second time) at Belmont in 2001 and the Woodward; the majority of his stakes wins came out west. Dam sire Dehere won the Champagne, the Hopeful, the Saratoga Special, and the Sanford. Hip #222 (pictured below): b filly, Songandaprayer – Naughty Natisha (Known Fact). Sold for $200,000. Sire with no specific New York wins and the filly does not have a distinguished racing pedigree; nonetheless, this is the filly that I waited to see go through the ring, as she’s a half sister to Naughty New Yorker, 2007 New York Bred Horse Of the Year and Champion Older Male. Naughty New Yorker has won: the Damon Runyon, the Sleepy Hollow, the Mike Lee, the Albany, the Red Smith, the Noble Nashua, the General MacArthur Handicap (twice), the Alex M. Robb Handicap (twice), and the Saratoga Sunrise Handicap. He’s placed in the Count Fleet, the Whirlaway, the Jerome, the Gotham, the Excelsior Handicap and the Cigar Mile. At six, he’s still racing, though his last few have not been up to his usual competitive standards. The weather was gorgeous and a great crowd at 31,000 plus. I criticized the card because I am a fan, but I am still there every day, as are most of the more critical fans such as myself. With the price of gas dropping rapidly and good weather ahead look for attendance to rise. I hung out at the stall for #299. I wanted to take the horse home. He was acting like a pet, playful and social, with an affinity to want to nuzzle you with his nose through the stall screen. Alas, he had no reserve and sold for $5,000. Maybe I could have had him after all! Hope your experience was better than at last week’s sales.And 1 more thing; in all my years at Saratoga, I have never been standing in the backyard with water halfway up my ankles. What a rain storm on Friday!! First time that I’ve skipped the NY-bred Saratoga sale in the past eight years, but, alas, I still have a couple of colts that I bought as yearlings in 2007 that I need to find additional partners for before I can go shopping again.Also, I think we’re seeing a continuation of the shift in the NY-bred market that’s been going on for some years. When I started buying them, in 2000, you could get a solid NY-bred allowance winner for a very modest price (I paid $15,000 for Introspect, who’s won $300,000k $14,000 for Raf and Ready, who won over $140,000, $17,000 or Seaside Salute, who won three years in a row at Saratoga, etc., etc. Now, with so many more Kentucky-sired, high-priced NY-breds, it’s much tougher to win those races with a modestly priced horse. In addition, now that NYRA has gone to writing all the NY-bred allowances as optional claimers, to enhance field size, that makes the competition tougher as well. So folks like me are, I fear, being priced out of this particular maket.